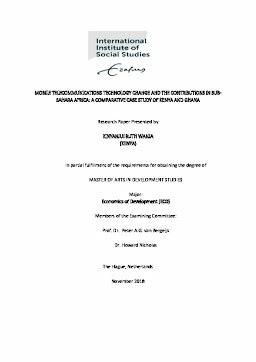 This research paper examines how institutional and technological change in mobile telecommunications has contributed to economic growth in Sub-Sahara Africa. This study draws attention to the liberalization and reregulation process and how telecommunications infrastructure has developed and contributed to the progress in the region. The study uses a comparative case study regarding Ghana and Kenya to investigate how these structural changes and reforms of policies and institutions influenced the performance of the industry in these respective countries. This paper uses two main variables to investigate telecommunications teledensity: mobile cellular subscriptions per 100 people and individuals using the internet in percent of population. The variation of these variables over time demonstrates how different policy concerns and implementation strategies contributed to the long-run success of the industry in the Ghana and Kenya. This study also investigates why Ghana performed better than Kenya in telecommunications. The study emphasizes the importance of institutions, technology change and strong competitive structures for a thriving sector. The findings of this study indicate that Ghana’s performance is attributed to a fast liberalization process and implementation mechanism tied with different strategies and institutional frameworks that encompassed increasing rural cellular density compared to Kenya. Thesis Advisor van Bergeijk, Peter A.G.